What is TOTB Recycling Guide? 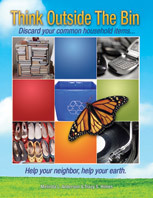 “Think Outside the Bin” is a reference guide full of internet clickable links, tips and resources. These resources help you discard your common household items in a responsible way. If they can be recycled, we let you know how. If they can be reused, we’ll give you some ideas for that as well. We’ve shared the best options we could find and included hundreds of links to websites that can help you. When you donate your common household discards to another person or organization, you are practicing “social recycling.” As we compiled the links for this book, we realized that the options for recycling were enormous, not just in sheer volume of information, but also in terms of many humanitarian efforts that exist. There are some very creative and worthy causes in need of our treasures, as well as our trash. Many organizations are already “thinking outside the bin” and using common items for a bigger cause. We’d like to introduce you to some of these organizations and ideas in hopes that you, too, will “think outside the bin” and consider a better option for disposing of your items. In the process, you may help a neighbor…and help the earth at the same time. This entry was posted in Think Outside The Bin. Bookmark the permalink.